wags83 wrote: Sounds like you got a lemon. Battery only lasted like 14-15 hours today, and that was after it turned on battery saving mode around hour 12. Hopefully it gets better after another full charge. I currently have the low powered watch face on all the time. Turning that off so it only shows when I left my arm will increase it by a little bit, but I would rather not do that. I'm the worst. Traded it in and got my 3rd one in a week. I'm living with this one assuming battery life levels out after a week of use. This is a male sports one. Does heart rate. Very happy with the 3rd watch I ended up getting. I haven't fully figured out heart rate stuff, but that's fine. Battery life is night and day difference compared to the previous one. Price is back to $275 and I got it for $150. Pretty happy about that. My only complaint is that there are some tiny scratches on the bezel already from me knocking it against things things because I'm not use to wearing such a bulky watch. That was bound to happen though. Good buy. If I hadn't just bought (three) Fossil smart watches in less than a week I would have given that one a shot. I read an article earlier this week about that one and how highly recommended it was. This may be my next smarch. 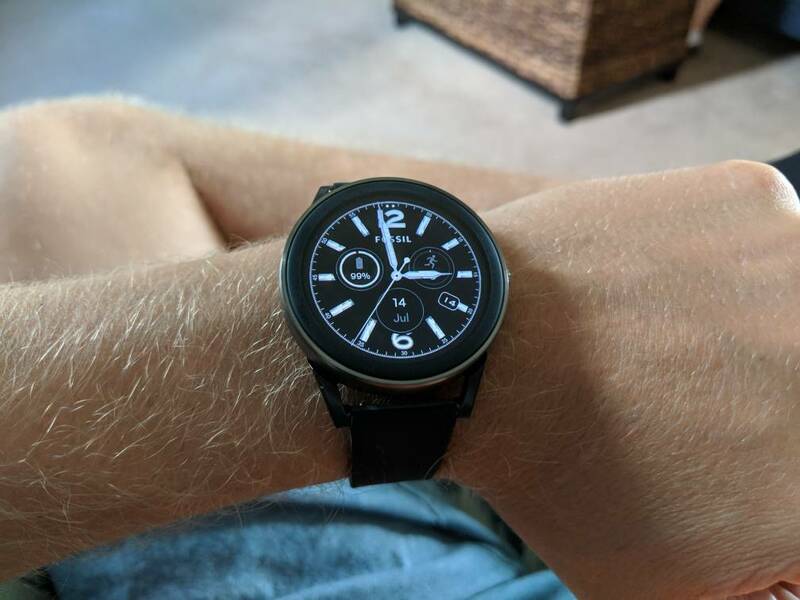 I currently have a Huawei watch (gen 1) and Moto 360 sport. The one thing I wish I had that these don't is NFC. ejhartman91 wrote: Source of the post The one thing I wish I had that these don't is NFC. I have never used NFC on a phone before, a watch not having it doesn't matter at all to me. I like it. Fits you well and that screen is massive. Why are you worry about durability? Tyler wrote: I like it. Fits you well and that screen is massive. It feels like plastic and it's extremely light. Just feels like it will break if I ever bump into something. After my factory refresh (because I'm dumb) this morning, I decided to look into new faces. Didn't want FOSSIL to be on it. Found this appafter reading some good recommendations. Tyler wrote: After my factory refresh (because I'm dumb) this morning, I decided to look into new faces. Didn't want FOSSIL to be on it. Found this appafter reading some good recommendations. Ahh. I remember this one now. It came out the day I bought my Fossil. The 30 day battery is very misleading, that is basically if you disable all of the smart features, right? Looks like 5 days is possible if you have it toggle between smart and dumb. Yeah, it was launched on Prime Day, it looks like. yeah, the website says it can get as much as 5 days on regular mode, I'm guessing if you shut off all the stuff and use very little smart options, you can squeeze out 5 days... in the video of the watch in action, the guy uses the watch toggling between the two modes. I like the size and the features of the watch. I've not heard of anyone using or owning one. So I was wondering how they worked. the reviews on Amazon have been good, so far. purple_hayes wrote: Source of the post the reviews on Amazon have been good, so far. Agreed. Looks like a great buy. But for $250 you should wait to see if Pixel does anything in the next couple of months. I may not have a choice, I did a reset on my watch and now it won't connect to my phone. Well crap, what idiot told you to try that?